Iain Boal is an amazing person. I met him last year here in Copenhagen where we went to visit the Copenhagen by Bike exhibition at the Copenhagen Museum. 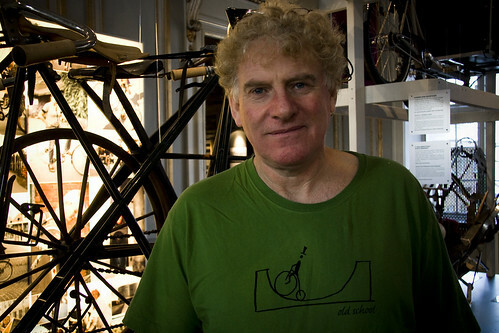 This Irishman is a bicycle historian and social historian, resident in California since 1985. He's returning to Copenhagen to speak at the same Copenhagen Museum on Tuesday, April 13, 2010 at 17:00. I highly recommend stopping by if you can. It's not everyday you get to listen one of the foremost bicycle historians in the world. Indeed, when we hooked up last year, I was entranced by listening to him speak about the history of the bicycle. My brain hurt afterwards. Brilliant stuff. He is publishing a new book - The Green Machine - in the fall of 2010 and he'll take us on a journey through some of the lesser known aspects of the bicycle's history. He also punctures some of the enduring myths along the way. We'll hear him speak about how a violent volcano eruption in Indonesia in 1815 affected the birth of the bicycle in Europe. He'll tell about how the invention and growth in poplularity of the rubber tyre for bicycles led to genocide in Congo. Iain Boal will present a new illustrated history of cycling, one designed for the 21st century and its interwoven crises. Drawing upon the artifacts of cycling history currently on display in the City Museum of Copenhagen, Professor Boal will trace the heterogeneous origins of the bicycle, busting some Eurocentric myths along the way. It is a fresh story that celebrates the bicycle's freewheeling sociability and the part that human-powered mobility must play in the human settlements of the future, but refuses to be blind any longer to the bicycle's entanglement with capitalist modernity's brutal labor process or its complicity with the automobilism that has paved the planet, rendered cities unconvivial, and now threatens the biosphere itself.